Although the common name of this fish is intended to allude to the similarity between the shape of its head and a garden spade, it is also appropriate in another sense. This fish is a digger. It doesn't dig for food but buries itself top to tail in the sandy bottom of Paraguayan riverbeds, its natural home. This camouflage is very effective especially when viewed from above. The other interesting feature of the spade catfish is a feature common to a number of the mid to large sized whiptail loricariids, its incredible array of web-like extensions to its suckermouth. Have a look at the photo below. The disc like suckermouth common among many loricariids has evolved into a structure more suited for searching and sifting than rasping algae or maintaining a fixed position in turbulent water. This adaptation is borne out by the aquarium behaviour. I have yet to see Spade catfishes leave the bottom of the aquarium voluntarily and they loathe being forced to. 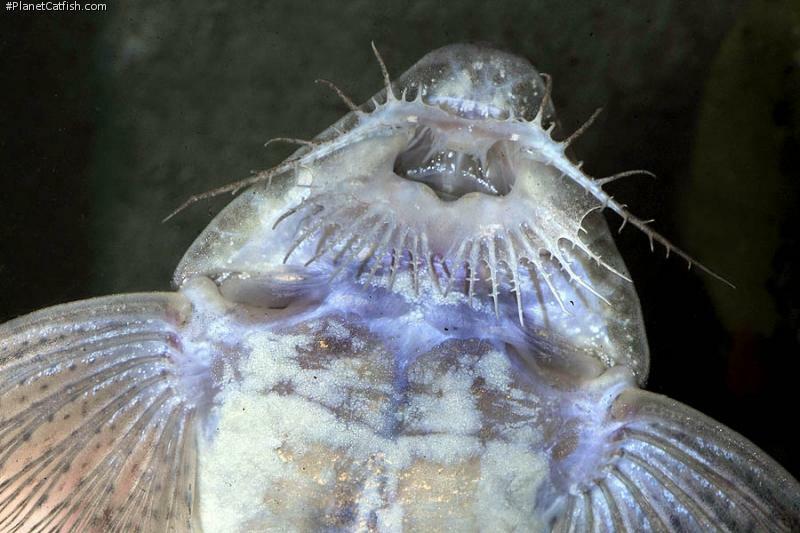 I had to move the catfish in the accompanying photo by hand in order to get a clear image of the underside of its mouth. As soon as my hand left the aquarium the fish returned to its sandy sanctuary, rapidly shuffling from side to side in order to sink into the sand. After a few seconds, once the sand settled, all that remained visible were the fish's small eyes. 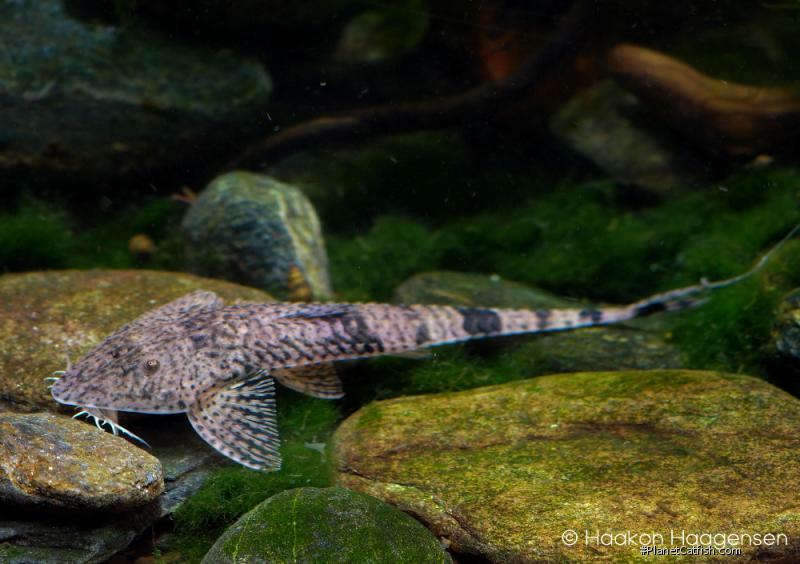 Although an effective ploy for escaping detection, the spade catfish does not eat fully submerged and certainly doesn't dig for food in the aquarium. In daylight, particularly if food is close by, the head of the fish will clear the sand and its feathered suckermouth twitches in the direction of food. Given the fishes tiny eyes and limited maneuverability, clearly taste aids the catfish most in the search for food. It crawls along the bottom, almost hauling itself along in a slow shuffle, putting one in mind of a soldier crawling on his belly, slowly and stealthily covering ground. This species is by no means timid. It is so quick to find food that often even relatively boisterous tankmates don't seem to bother the fish or cause lack of food supply. It is just short of being considered a large loricariid and as such is well within many aquarists' reach. Identification The most commonly available spade catfish. Sexing Unknown. Being a lip-brooder, differences in the formation of the suckermouth fringes may be observed. Distribution South America: Uruguay, Paraná and Paraguay River basins. Other Parameters Requires fastidiously maintained water quality. Furniture Large open expanses of sand are required, at least the length of the fish squared. Floating plants will help the fish settle but are not mandatory. Rooted plants will not stay that way for long however. Suggested Tankmates Any non-bottom dwellers, this species needs its substrate. Larger established spade catfish will live happily in a South or Central American cichlid set-up. Breeding Has been spawned by German aquarists; no details currently available other than the species is a lip-brooder.